After a lengthy hiatus so that I could concentrate on my first few months of treatment for leukemia, I am back and ready to blog up a storm. I've spent some time redoing the blog -- it isn't perfect yet, but it is functional, clean, and simple. Ideally, I would like to move to WordPress in the near future and I don't yet have the money that would make that possible. For those of you wondering about my health, I'm making major strides in might fight against leukemia. It's been a hard few months and I'm still adjusting to life with it and the way it changes your body, but overall, I'm recovering and I have a very good prognosis. Playing catch up: I have lots of books that I've received for review that I am working my way through. I also have books that I received for blog tours that I could not participate in. I plan to review as many of those books as possible. Thank you to the touring companies, authors, and publishers who were so understanding. I have not forgotten you! More original content and less promotions: Once I do make up my blog tour posts, I'm going to be participating in a significantly smaller amount of them. I have LOTS of books to read, I have been granted access to lots of great eARCs, and I don't want my blog to become one giant advertisement. I may still do tours here and there and if approached by a company, author, or publisher, I'm happy to try and figure out how to do something for you/them. But I want to focus more on great posts about books I enjoyed and talking more about books as opposed to just reviewing. 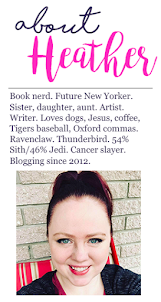 I also am striving for more original content -- look for Throwbook Thursdays (reviews of books I read a long time ago but still love), Book Nerd Problems (general posts about books, proud geekdom, the way I'm feeling about books in general), and a few other ideas I have up my sleeve. Posting regularly: At least three posts a week, if not more. But I'll be starting slow -- baby steps are VERY important as I try to regain some semblance of a normal life without spreading myself too thin. Going to more book related events: Conferences, meet and greets, book signings, any place where I can mingle with more book lovers, bring you guys more awesome content, and generally hang around more people who are book nerds. Thank you so much for all of your well wishes and patience while I get back into this! I've missed it greatly!